in St st with 2 strands held tog on smaller needles. -Finished Size: 4 1/2” wide and 52” long. 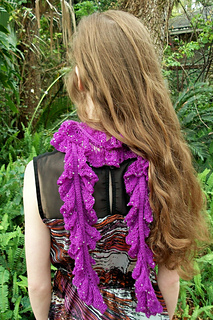 -Yarn: Brown Sheep Company Legacy Lace (75% wool, 25% nylon; 430 yd 393 m/1 ¾ oz 50 g): lace 90 electric violet, 1 skein. -Needles Center panel—size 3 (3.25 mm). 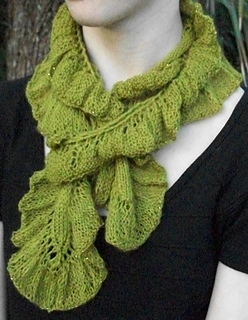 Ruffle—size 7 (4.5 mm): two 32” or longer circular (cir). Adjust needle size if necessary to obtain the correct gauge. -Notions: Markers (m); tapestry needle; beading needle; about 850 size 8/0 seed beads. -Gauge: 32 sts and 22 rows = 4” in St st with 2 strands held tog on smaller needles. 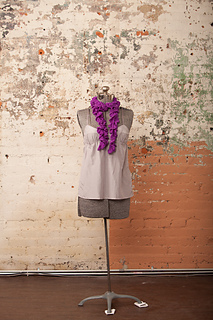 Gracile is an elegant, yet simple, ruffled scarf inspired by ballet movements. 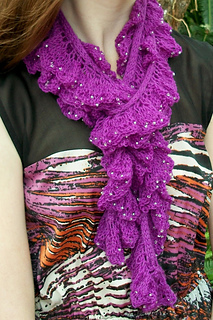 Although only lace weight yarn is used, this scarf has the appearance of two different yarn weights, and beads add a pleasant shimmer.